The Center City Housing Incentive Policy spurred the development of more than 6,500 housing units downtown at a cost for the city of more than $100 million to developers. Two council members voted against the measure: District 7 Councilwoman Ana Sandoval and District 4 Councilman Rey Saldaña. Saldaña peppered Assistant City Manager Lori Houston with questions about how to require more affordable housing in the developments. The response was that the market wouldn't bear it. He asked for a 30-day postponement, but the measure failed to get enough votes from the council. City staff has revisited the policy several times to add requirements for affordable housing. The original CCHIP had none. The new policy expands CCHIP beyond downtown, and now includes 13 regional centers across the city. Each level has differing requirements for affordability and incentives for builders. 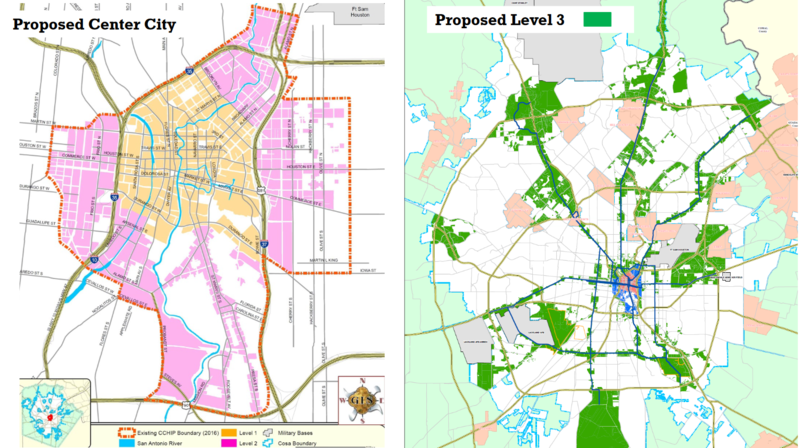 The boundaries for the Center City Housing Incentive Policy now extends beyond downtown San Antonio. Community organizers failed to delay the vote. They had asked for impact studies on how it might displace low-income residents. Christine Drennon, a professor at Trinity, criticized city staff for using federal Housing and Urban Development affordability metrics, claiming San Antonio residents can afford far less. Under the new policy, a rental property project could be incentivized if the average rate was under $2.75 per square foot, which means a 500 square foot loft would go for $1,300. “I don’t know what family is going to fit into 500 square foot or be able to afford $1,300,” Saldaña said. Several affordable housing developers spoke in support of CCHIP, and using the federal calculation. Opponents did praise changes including the exclusion of all properties zoned as single family or mixed residential from receiving CCHIP incentives — even if they are later rezoned — and projects that displace current residents. Also, any property constructed with CCHIP funding would be ineligible for some short-term rental permits, which are required for renting unoccupied properties on sites like Airbnb. The city will have to reapprove the measure in two years. It also passed an expanded fee waiver program. The program was placed on hold by Nirenberg in December of 2017 over concerns it was raising property values. The program was created in 2012 as part of then-Mayor Julian Castro’s “Decade of Downtown” — an urban renewal project, encouraging housing in a center city that had been dominated by hotels. According to a city-commissioned study, 64 projects were funded by the program, resulting in 6,543 housing units downtown. It also helped fund 164,099 sq. ft. of retail space and more than 46,000 sq. ft. of office space. City staff call CCHIP a success. While praising its progress, many on City Council who supported the measure asked that it be closely monitored. “This is going to be something we will continue to not take our eyes off,” said Rebecca Viagran, councilwoman for District 3. Mayor Ron Nirenberg, who supports an impact study of CCHIP on current residents in the urban core, said he understands the community’s concern that the "Decade of Downtown" could become the "Decade of Displacement." "(That’s) something no one on this council will allow to occur," he said.